With the Tom Cruise film Oblivion open everywhere but the US I thought I'd take a minute to say a few words about the film now before the avalanche of Tribeca stuff takes it's toll. 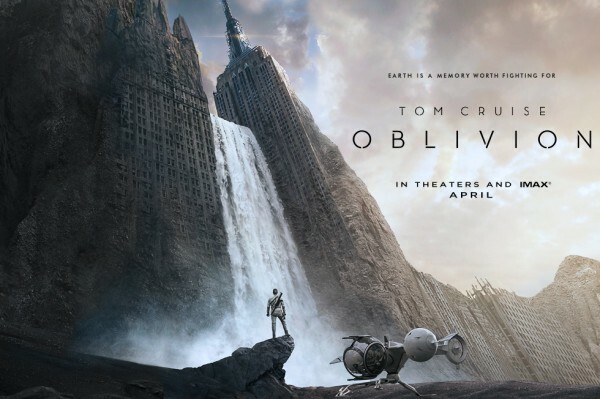 The film has Tom Cruise as Jack Harper one of two humans left on earth. It seems that an evil race of aliens called the Scavengers destroyed the moon and attacked the earth. We on earth won the war but have to leave the planet and go to Saturn's moon Titan because most of the world is uninhabitable. Harper's job is to repair the drones that are keeping watch on the earth. As the film opens Harper's time on earth is coming to a close, he's going to be sent to Titan. Unfortunately some weird things are happening and some memories are crashing through (Harper and his partner Julia have had their memories wiped so that if any of the Scavengers get them they can reveal nothing) and it's becoming clear that the truth of things may not be as he's been told. The short version of the story is that this is a good film that's probably too long by half an hour. While the story is largely solid, except fora cake and eat it too ending, it doesn't break any new ground. We've been here before any number of times. That's fine except that the film is paced as if each turn is a grand revelation when in fact we're 15 steps ahead of it. I could list at least a dozen films that are either referenced or stolen from, but what would be the point to tell you whats going on before you go in when the film does so on it's own almost from the get go. As I said it's a good film, but it really isn't that special. With much of the big budget crap being churned out these days you can do much worse than this, and if you want to see a spectacular film on a big screen give it a shot. A word of warning: If you are going for Morgan Freeman know going in that he only appears for a couple of minutes at the end of the first hour. He then shows up again for more screen time in the final 30 minutes. He's not really a star of the film and was hired for his presence rather than anything else.